"Meet me at the Ferry Building!" Find out about new items, special events, and so much more! Acme uses only organic flour and works closely with farmers in evaluating and selecting the grain varieties for its flour each year. Heath Ceramics, one of the few remaining mid-century American potteries, has been making tableware and tile for over a half-century in its Sausalito, California factory. Gott’s Roadside is a tried-and-true local favorite. Gott’s serves juicy cheeseburgers, great hot dogs, incredible onion rings, hand-spun shakes alongside crispy Ahi Poke tacos, Chinese chicken salad, and a renowned Ahi burger. This quaint shop offers a variety of nuts – almonds, pistachios, walnuts, pecans. The almonds come in a variety of flavors – applewood smoked, cinnamon honey, lemon chili, maple, almond meal for baking, slivered almonds, and much, much more. The Eatery serves up Americana food you can feel great about. Bay Crossings, a privately owned company that was created to meet the needs of ferry commuters and tourists, is a ferry ticket shop and ferry and tour information center. beekind sources honey from it’s own hives, which they do not treat with pesticides or antibiotics. They also source from other beekeepers around the Bay Area and the country. They offer a wide selection of popular local honey like Sebastopol Wildflower and the rare Redwood Forest Honeydew from Guerneville. Benedetta is a Sonoma County-based skin and body care line made from farm-sourced botanicals. Ingredients come from Certified Organic and Biodynamic farms, many of them local. Each product is made by hand in small batches to assure quality and freshness. Every Saturday, Biscuit Bender offers a variety of homemade biscuits - from sweet (cinnamon, peanut butter chocolate chip, lemon poppy seed, Mexican Hot Chocolate) to savory (wild mushroom, bacon maple, corn jalapeno). Blue Bottle Coffee has two locations in the Ferry Building Marketplace. The older location is a modern espresso bar in the north nave, and the newer location, their Tasting Room, is out front in the North Arcade. Book Passage is a charming bookstore on the Bay side of the Ferry Building Marketplace. You’ll find new fiction and nonfiction, local travel guides, cookbooks, kids’ books, and a diverse array of cards, gifts and San Francisco souvenirs. Boulettes Larder, a respected restaurant venue serving breakfast, lunch, and Sunday brunch, presents a visually stunning larder which serves as a discerningly selected and daily changing market for prepared food as well as grocery elements which include an extensive spice selection, Japanese ingredients, and carefully prepared sophisticated pastry items. The Ferry Plaza Farmers Market is a California certified farmers market operated by the nonprofit Center for Urban Education about Sustainable Agriculture (CUESA). 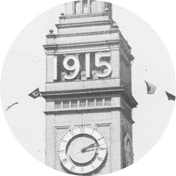 What makes the Ferry Building San Francisco’s most famous landmark?